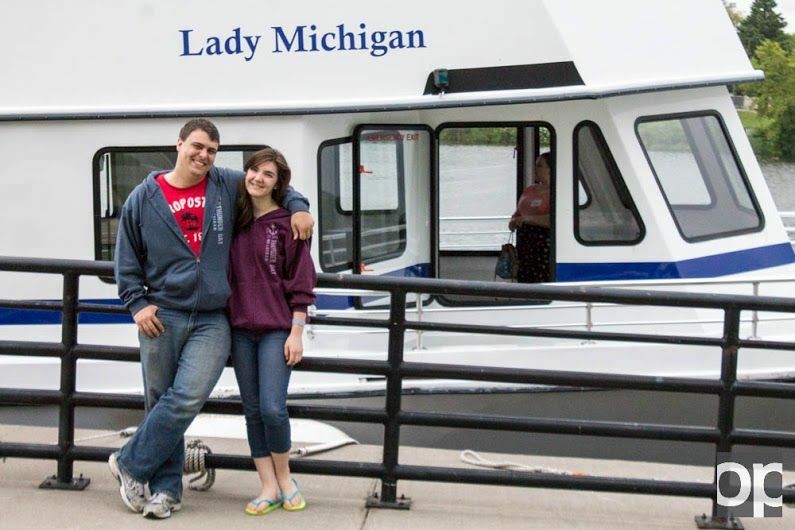 Edd Bunch and Dani Cojocari stand in front of the Lady Michigan after touring the shipwrecks in Thunder Bay. Michigan is known for its lakes, primarily, the Great Lakes. The Lower Peninsula is surrounded by two major lakes: Huron and Michigan. Each of these shorelines have hidden gems that are easy to visit. The Sleeping Bear Dunes are a must see for anyone who lives in Michigan. My boyfriend and I were able to climb the mile high dunes in about a half hour (with plenty of breaks in between to enjoy the scenery.) We didn’t even make it to the shoreline, which was another mile of hiking away. Lots of kids roll or run down the side of the dunes, effectively tripping over their feet in the process. It’s definitely a work out, but it’s worth being able to say you climbed the famous dunes along Lake Michigan’s shoreline. Across the state in Alpena are shipwreck tours. Hundreds of ships have shipwrecked along Lake Huron’s shoreline. The two hour long boat ride through Thunder Bay takes you to different shipwreck locations. The glass bottom of the double decker boat lets you see the wrecks up close. Thankfully, none of the shipwrecks visited on the glass bottom boat tours had casualties, so you can enjoy looking at old hunks of wood and metal without feeling depressed. About two hours away from Alpena is Tawas. It’s a small town, but it is home to a cute downtown shopping area and a lighthouse. Lighthouses aren’t uncommon along the coasts of Michigan and they can be found in both peninsulas. I would recommend visiting one and taking the tour inside. Caseville is a small town located at the tip of “the thumb.” In August, Caseville hosts the Cheeseburger Festival. I’ve never been, but I’ve heard it’s a total mad house. The ten day long festival was created as a tribute to Jimmy Buffet and they celebrate several different types of cheeseburgers. Lightshows, sandcastle making and concerts are only a few of the events listed on their website. Ahh, the U.P. A magical world of its own. While there, my Dad called it “South Canada,” because it didn’t feel like we were in Michigan anymore. We had our first pasty there, saw the natural waterfalls and explored the shores of Lake Superior. If you’re ever tempted to go to the U.P., there are a few places you should visit. The first is Sault Sainte Marie. There, you can watch the freighters travel between Lake Superior and the lower Great Lakes at the Soo Locks. If you’re more interested in natural beauty over ships, head up farther north to Tahquamenon Falls. They are Michigan’s most famous waterfalls. Their rusted color is due to the iron deposits, giving them a root beer hue. There are two different falls, the upper and lower falls. It’s a few miles hike between the two of them, but you can easily drive the distance. Another source of natural beauty is right along Lake Superior’s shore. Pictured Rocks is a popular tourist site. You can take a boat tour along the shoreline to look at the rainbow colored cliffs. The waters, although ice cold, look tropical. It’s clear and a bright turquoise, which enhance the red and orange hues of the limestone shoreline. If a two hour long boat tour isn’t your style, you can kayak and hike along the shore. A real hole-in-the-wall place to visit is located in St. Ignace. It’s called “The Mystery Spot” and it’s a place of gravity-defying wonder and amazement. For some reason, that specific area has strange magnetic fields that give people the ability to walk on walls (to a certain degree.) They also have a forest maze you can try as well as zip lining. Overall, it’s a fun place to check out before heading back to the Lower Peninsula. Overall, there are many places to visit and things to do within Michigan’s borders. It’s a great way to learn about the state many of us Oakland University students were born and raised in. Even if you’re a transfer student, take the time to explore the Mitten State. I think you’ll give it a big thumbs up.